Time is money… Get In & Get Out with our New Drive Up Window For Contractors. 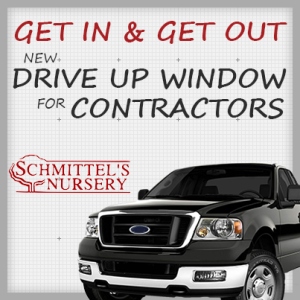 Schmittel’s Nursery values our contractors’ time. We realize that time is money and the quicker your are loaded, the better. Therefore we decided to implement an expedited process for mulch and topsoil pickups. Simply pull up to our new drive up window, we will take your mulch and/or topsoil order, and you’ll be on your way. It’s that simple. We hope your Spring is prosperous and look forward to seeing you soon.